Most of our readers are likely very familiar with the concept of startup competitions. It almost seems impossible to keep up with the awards and prizes handed out at such events being held week in and week out. However, we are very proud to share that we were able to pull of a truly unique startup competition yesterday at PAPIs Connect in Valencia, one where human judges stepped aside and let Artificial Intelligence figure out the winner. The brains behind this program was designed by PreSeries, BigML’s joint venture with Telefónica Open Future_. As such, this organization marked the first public demo of PreSeries, which also began collecting beta user applications on its web site simultaneously. Marco Laucelli, Novelti CEO; Ana Segurado, Telefónica Open Future_ Global Manager; Francisco J. Martín, President of PreSeries and Co-founder and CEO of BigML; María Pocoví Úbeda, Emotion Research Lab CEO; Alicia Mora Benimeli, Emotion Research Lab COO and Co-founder; Damià Garcia Priu, Co-founder and Business Development of Restb; Carlo Caunter, Co-founder of Datatrics; Eudald Camprubi, Intranetum CEO. Datatrics makes Predictive Marketing accessible, actionable and easy to use. Emotion Research Lab helps companies measure the emotions of their customers using facial recognition. Intranetum is a smart knowledge sharing tool to help companies, teams and organizations work smarter together. 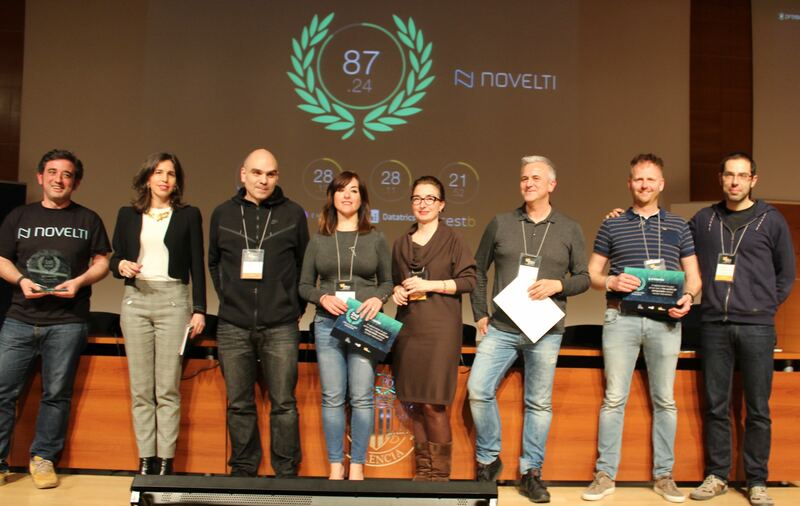 Novelti is a streaming analytics provider for the Internet of Things. All the presenters did a phenomenal job with the pitches and it was time to proceed to the evaluation phase. Each participant was welcomed back to the stage one by one and the PreSeries’ intelligent agent asked them a series of questions to determine their score based on the underlying model that was trained with the insights from 27000 global investors’ activities. The questions spanned a many relevant dimensions such as the founding team’s prior experience, their existing patent portfolio, and details on previous rounds of financing. In the end, PreSeries revealed the winner to be Novelti with the highest score of 87.24 out of a possible 100. Telefónica Open Future_ Global Manager Ana Segurado presented the prize to the winning team, which includes free admission to Wayra Academy, Telefónica’s startup accelerator. In addition, Novelti will directly participate in the AI Startup Battle World Finals to be held in Boston at the end of 2016. We wholeheartedly congratulate team Novelti and want to wish each participating team the best in the remainder of their journeys. As a team with a number of serial entrepreneurs, we believe that PreSeries’ public version that will be revealed in the coming weeks is going to close a big gap that has stood in place for the longest time in the human relationship driven, old fashioned world of early stage technology venture investing: Objective and constructive feedback on where your startup stands today!